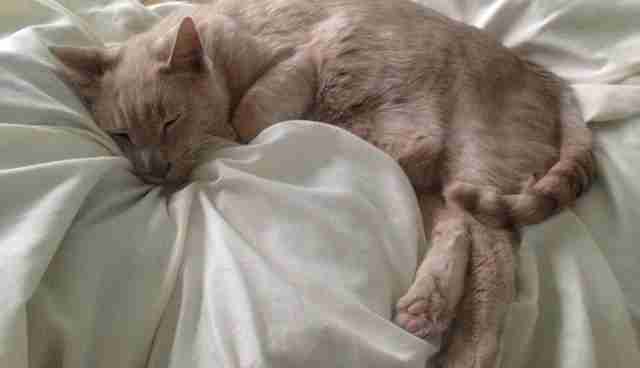 Three years ago, an elderly male cat was found sitting alone in a parking lot in Connecticut. 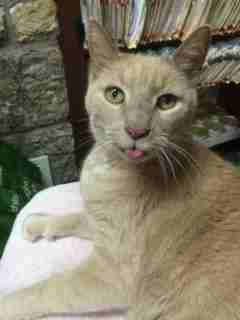 He was extremely emaciated and had an infection on his front right paw. An anonymous tip to Noah's Ark Animal Hospital ultimately alerted the staff to the cat's whereabouts. "He weighed about 7 pounds when we brought him in," Rachel Keyes, an assistant at Noah's Ark, told The Dodo. 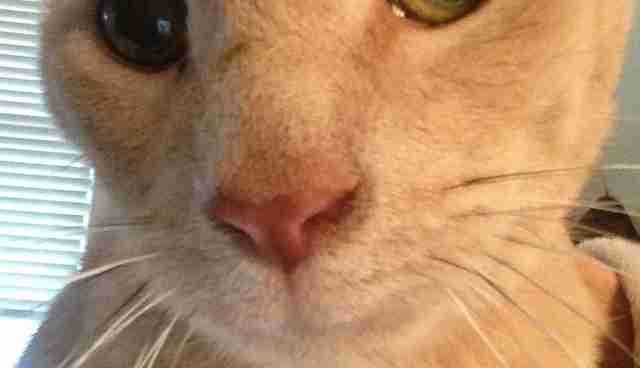 "We ran a bunch of tests on him so we could do a full exam and help bring him back to health." Medical staff found that he was anemic and had stage 2 kidney disease, among other illnesses. 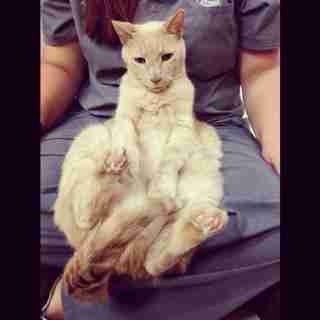 The staff at the hospital named the cat Billy and, as they worked to bring him back to health, became incredibly attached to him. That was how Billy found his new home at Noah's Ark, officially becoming the hospital's feline mascot. "Billy had free reign of the hospital," Keyes said. 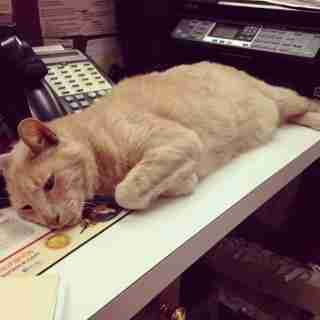 "He just roamed around everywhere and made his own little spot at the front desk in the reception area. Any time clients came in, they'd say hi to Billy and Billy was very friendly in return." Under the watchful eye of hospital staff, Billy, now 16 years old and a healthy 13 pounds, blossomed into a mellow, loving office cat. He was just one of the family, said Keyes. One of his favorite pastimes included "shaking hands" with the receptionists. But at the end of last month, Billy and Noah's Ark were met with an unexpected surprise. A new client - a father and daughter - visited the hospital. As Billy walked by, the father commented that the cat looked an awful lot like the one their family had lost years ago. His name was Batuffolo, known as Tuffo for short. As the man and his daughter continued to speak with the receptionist, Billy suddenly did something very out of character. "Billy recognized them and jumped up on the very top of the counter, which he doesn't do," Keyes said. "Then, he jumped right into their arms. Billy lets people pet him, but he never jumped into anybody's arms." The receptionist then began to ask the father and daughter about the cat's tendencies, to see if they matched Tuffo's. Billy, in particular, has a unique way of drinking water - he scoops it up with his paw first before drinking. Tuffo was known for doing the same thing. "Later that afternoon, they came in with other members of the family and Billy's twin brother, [Cotone]," Keyes said. "The two cats recognized each other immediately." A few days later, Billy was taken back home to be with his beloved sibling and family, after a three-year separation. The hospital now keeps in close contact with Billy's family, the Sicconis. As it turns out, after a move during the summer of 2013, Billy wandered away from home and never came back. But now he's home safe and sound with his loved ones, thanks to the equally loving care provided by Noah's Ark. "While we're very sad that Billy is gone, we're very happy that Billy is back with his rightful owners and appears to be very happy and well-adjusted," Keyes said. You can keep up with the adventures of these reunited twin brothers on Facebook.